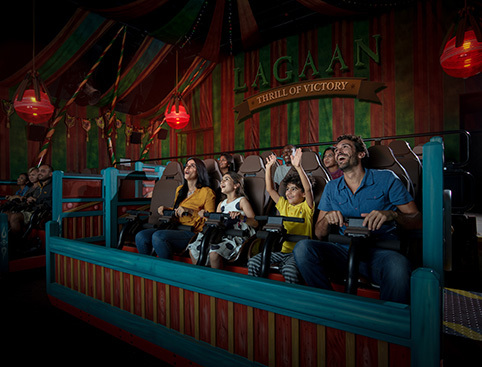 Choose from MOTIONGATE™ Dubai, Bollywood Parks™ Dubai, LEGOLAND® Dubai or LEGOLAND® Water Park. Includes entry to MOTIONGATE™ Dubai, Bollywood Parks™ Dubai, LEGOLAND® Dubai and LEGOLAND® Water Park. Ticket valid for 6 months from the date purchased. You will be emailed an e-ticket that must be printed on receipt. Upon arrival, simply scan the barcode at the gate for admission to the parks. Validity: Tickets are valid for redemption for 6 months from the purchased date. This is an open dated ticket and it is valid for 6 months from the purchased date. This is an open dated and can be used within 6 months from the purchased date. Experience the world of How to Train Your Dragon in Dubai! 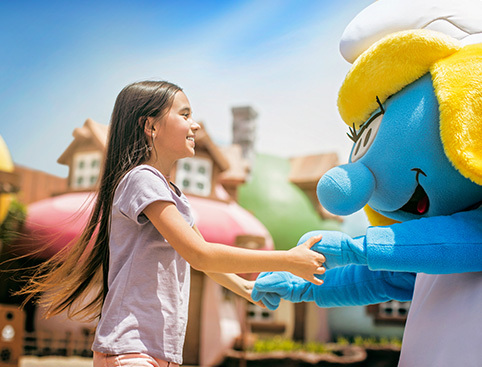 Up to 4 Dubai Parks and Resorts with 1 ticket! 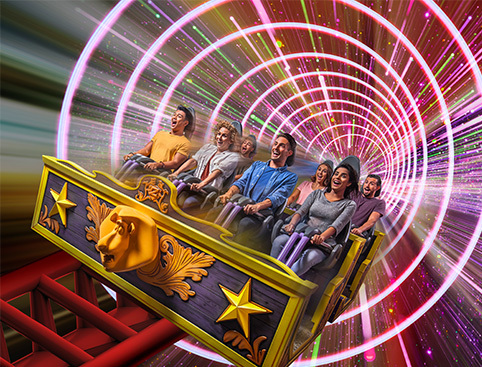 Visit all four of Dubai’s most sought after theme parks with the Dubai Parks and Resorts ticket. It’s time visit the land of brightly coloured bricks and discover LEGOLAND® Dubai. Get behind the scenes and explore the LEGO® Factory to see how each and every colourful brick is made – who’d have thought so much goes into it! Put all your handy skills to the test at LEGO® City. Try your hand a flying a place and even see if you have it in you to save a burning building. You’ll even get the chance to earn your very own Driving Licence – at least only a LEGOLAND® one. Fancy yourself as a bit of a designer? See if you can dream up fabulous new LEGO® inventions and have a go at creating your own robots. Whether you big or small, young or old – not that it ever matters of course – everyone will love this spectacular park. Want to cool down or just fancy a splash? 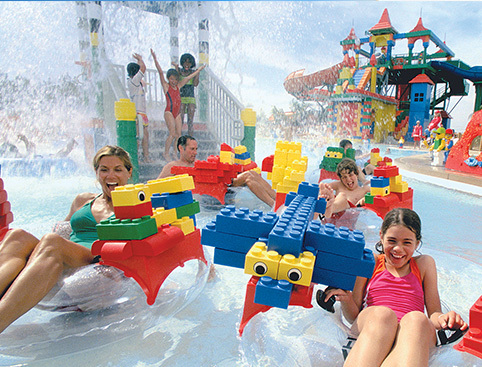 If you have young kids, this is the place for you – LEGOLAND Water Park is the only water park in the region designed specifically for children aged 2-12 and their families. Head over there and experience over 20 water slides – from big drops, to multi-slide racers, to smooth twisting rides. Feeling creative? Get into some hands-on fun with the kids – build your own LEGO raft or a boat. Fancy yourself as a bit of a movie fan? Then Motiongate™ Dubai is where you should be! From Hotel Transylvania to Ghostbusters, The Hunger Games and more, you’ll have everything you need to keep you well entertained. Point out your favourite Movie Stars and characters as you walk round the park – you’ll feel as though you’re actually in the movies. Enjoy live entertainment on and off stage, as well as fantastic rides inspired by your favourite Bollywood films. Explore the Bollywood Hall of Heroes, and head from the rags of Rustic Ravine to the riches of the Royal Plaza. LEGOLAND® Dubai and Water Park daily: 10am – 6pm. Children aged 2 and under may enter free of charge and do not require a ticket. Tickets do not include parking fees, and parking is subject to availability. Once tickets are issued, no refunds or amendments can be made. 100% cancellation charges apply. You’ll receive an initial confirmation from us immediately. Please print your e-ticket and present it at the park entrance. Dubai Parks And Resorts reserves the right to vary the opening and closing dates and times of the attractions and to close, remove or cancel all or any part of the rides, events or facilities within the attractions for any reason including, but not being limited to technical, health and safety and/or operational reasons or due to special events or private functions. Dubai Parks and Resorts is rated 4.8 out of 5 by 4. Rated 5 out of 5 by Rooney from Motiongate Fantastic family day out, excellent value for money will be returning next family holiday to do Bollywood. Rated 5 out of 5 by Yorkiesunseeker from Great day out and NO queues Great value from Attractiontix with prices significantly less than on the gate or anything that could be obtained locally. Motiongate was great fun made especially so due to there being no queues for any attraction. Highly recommended during the cooler months but the thought of long queues in 40C+ doesn’t appeal. Rated 4 out of 5 by Fiona3108 from A good day out We arrived about 10:30am and our initial thoughts were "Mmmm not sure about this" as to get to Motiongate you have to walk through the Boardwalk area which isn't the most inviting of places as many are still boarded up or haven't opened yet. HOWEVER that place comes alive at night as restaurants etc are open. We went on New Years Day and I have to say it was great in respect of very few queues but the express pass bought in the park was still worth it. The park is a great mix of attractions with something for everyone - some rides look innocuous enough but don't let that fool you!! The place doesn't have the razzamatz of Universal or Disney and there is something missing that I can't put my finger on but maybe as the park grows older (it's only open 2 years) and more people become aware it's there that will change. In saying that it's a great day out - we bought the 2-park ticket but didn't make the second park as my 2 boys were enjoying themselves so much!